Plantar fasciosis/fasciopathy: is the term used to describe heel pain caused by degeneration (deterioration) of the plantar fascia which often occurs as a result of repetitive stress following chronic plantar fasciitis. The most common pain experienced with plantar fasciosis (the non inflamed phase of plantar fasciopathy) is pain after sitting or first step in the morning. It is important to note however that if you are experiencing an increased level of pain in your heel than the previous day or the pain is occuring towards the end of the day, you may have re-injured the area and are thus in the inflammatory phase of plantar fasciopathy called plantar fasciitis. As most cases of plantar fasciitis tend to progress to plantar fasciosis, plantar fasciopathy has become a more appropriate term for this condition. Unfortunately, plantar fasciosis (the degenerated and non-inflamed phase of plantar fasciopathy) is much more difficult to treat when individuals fail to recognise it as the non inflamed phase of the condition and continue to treat it as though it were inflamed. By treating the non inflammed phase of plantar fasciopathy (plantar fasciosis), the needed rehabilitation of the degenerated area does not occur. The good news is that most cases of plantar fasciosis resolve without the need for cortisone injections, surgery or other invasive treatments. Plantar fasciosis usually develops over time after the inflammation of the plantar fascia has subsided. Although it can affect both feet, it more often presents in only one foot at a time. - Heel pain after, but not usually during exercise (unless there is a larger tear present). - Heel pain at the end of the day. - Chronic swelling in your heel that has been present for some time. Increased physical activity and overload. Plantar fasciitis is common in long-distance runners. Jogging, walking, ladders or stair climbing also can place too much stress on your heel bone and the soft tissue attached to it, especially as part of an aggressive new training regime. Even household exertion, such as moving furniture or large appliances, can trigger the pain. Changes in footwear or poor choice of foot wear. Shoes that are thin-soled, loose, lack arch support or the ability to absorb shock don't protect your feet, and in some cases cause added stress. If you regularly wear shoes with high heels, your Achilles tendon (which is also attached to your heel) can contract and shorten, causing strain on the tissue around your heel and walking abnormalities. Recent weight gain- the extra weight on your feet can lead to an over load on your feet, including of the plantar fascia, causing it damage. Low arch (flat feet/pronation) or high arched (rigid feet) or abnormal walking patterns can adversely affect the weight is distribution when you're on your feet, putting added stress on the plantar fascia. Arthritis. Some types of arthritis can cause inflammation in the tendons in the bottom of your foot, which may lead to plantar fasciitis and progress to plantar fasciosis. Pressure and strain on your feet from tense muscles, instability or long hours of walking or standing such as in new mothers, factory workers or those in retail etc. Instability and other gait changes or compensations can lead to excessive strain on the region leading to micro tears over time. Foot compression sleeves such as the FS6 foot compression sock can provide some relief to the healing plantar fascia. Your doctor or Podiatrist will ask you about your symptoms and look for points of tenderness in your foot. This can help rule out other causes of heel pain, such as other tendinitis or tendinosis', fractures, arthritis, nerve irritation, cysts etc. Your Podiatrist may also suggest an ultra sound to confirm the diagnosis, and may even order an X-ray to rule out the possibility of a stress fracture or other pathology. - Preventing Harmful Activity by reducing the activity that caused the problem in the first place is a major step to over coming plantar fasciosis. Remember to take care when walking up or down stairs, standing on ladders, kneeling or squatting as this can also be aggravating..
- Orthotics to correct abnormal walking and to limit excessive pronation and minimise destructive forces when present. - Shoes. Wearing sensible shoes is a vital part to preventing negative forces on the fascia. - Stretching of the Achilles tendon and plantar fascia. Stretching of the Achilles tendon is beneficial in people with a tight achilles tendon. It helps to reduce the destructive forces on the plantar fascia. Stretching of the plantar fascia is vital to promote correct alignment of the collagen fibres as they heal and should be done each day. - Strengthening exercises prescribed by your podiatrist. These may include such exercises as picking up marbles or scrunching up a towel with your toes. These exercises help strengthen the intrinsic muscles of the feet which improve foot function. - Massage of the plantar fascia helps to promote blood flow and healing in the area. - Warmth, such as that from a wheat bag may be indicated to assist with the rehabilitative process once inflammation has been ruled out. - Ice Massage's can be effective in reducing pain in some cases and can be done by freezing a 600ml bottle of water and rolling your heel on it firmly. - Cortisone. If needed your podiatrist can refer you for an ultrasound guided cortisone injection. - Surgery Less than 5% require surgery and even then its not often warranted. This type of surgery can be performed by an orthopaedic surgeon. - Maintain a healthy weight. 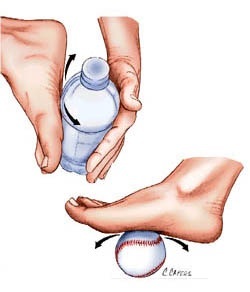 This minimizes the stress on your plantar fascia. - Choose supportive shoes. Forget the stilettos for the time being and avoid shoes with excessively low heels such as soccer boots, and thongs. Shoes with a low to moderate heel are best. Other features that are important include a good arch support, firm support around the heels and shock absorbency. Try to avoid going barefoot as much as possible, especially on hard surfaces and avoid shoes that are too soft, which can cause added stress to feet. - Start sports activities slowly. Warm up before starting any athletic activity, gym program or sport, and start a new exercise program slowly as plantar fasciitis and plantar fasciosis is often seen in the "Weekend Warrior" or when the 40 something year old man decides to become a runner for the first time in his life and goes too hard on his feet. - Stretch, Stretch, Stretch. Before you do any activities or even before going to work for the day give your arch and Achilles Tendon a good (but gentle) stretch. Stretching the arch helps reverse the tightening of the plantar fascia that occurs overnight gently. Heat & Ice? Which do i use? Running shoes: What should i look for?